What if you could create a landing page for each of the various communities you specialize in and set-up an email opt-in form to broadcast all of the latest listings to new subscribers, daily. Here’s a list of all of the new homes for sale in Irvine for today. Let me know if there’s anything here that you’d like to go see. A dsIDXpress account. This will allow you to use shortcodes to display listing content on a page. A dsSearchAgent account. This will allow you to create an RSS feed for IDX results. An email newsletter service that lets you broadcast RSS-to-Email updates. Like Aweber or Mailchimp. The Simple Sidebars plugin (if you’re using the Genesis Framework) or the Custom Sidebars plugin. Either of these will allow you to create a custom sidebar for various pages on your website. You’ll see why this is important in a moment. Step 1: Create a new page in WordPress. 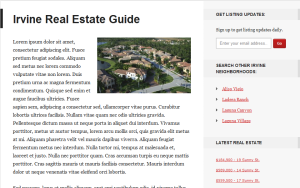 I’m using a content/sidebar page lay-out with a custom sidebar set for the page to display 1.) a custom email capture form specifically for that page, 2.) an IDX Areas widget to display additional relevant listings in that area. Basically, the sidebar content matches the content on the page. Set the title for my page: Irvine Real Estate Guide. Add 1-3 paragraphs of descriptive text about the community (including a photo). Add links to search Irvine homes for sale by price range. Each of those links link out to virtual pages generated by the custom link structure for dsIDXpress. Finally, add shortcode to display the latest listings in the area based on the newest ones to have hit the market. 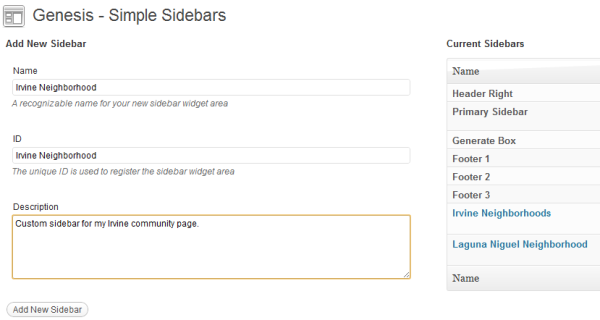 Step 2: Create your custom sidebar. Using the Genesis Simple Sidebars plugin, this is fairly easy to do. Once you’ve downloaded and activated the plugin, navigate over to do “Genesis – Simple Sidebars” menu (it’s under Genesis in your WordPress dashboard). Once there, you’ll create your new sidebar by titling your sidebar, giving it a unique ID which will register it in your Widget area. From here, all you have to do is customize the content on your sidebar however you’d like it to appear. Click on the “Lists” tab on the upper right. Click on the “Create List” button on the left. Give your list a name, assign a default “From” name, a default “reply-to email” and complete the rest of the steps for setting up your list. Once you’re done, you can click on the “Send to list” option. That will take you to the Campaign Builder page. There, you can select and RSS-Driven Campaign. This is where dsSearchAgent comes in… You’ll log into your Control Panel and create a custom link for listings in the city of Irvine. Once you create and save your custom link, you’ll see it with the rest of your custom links. 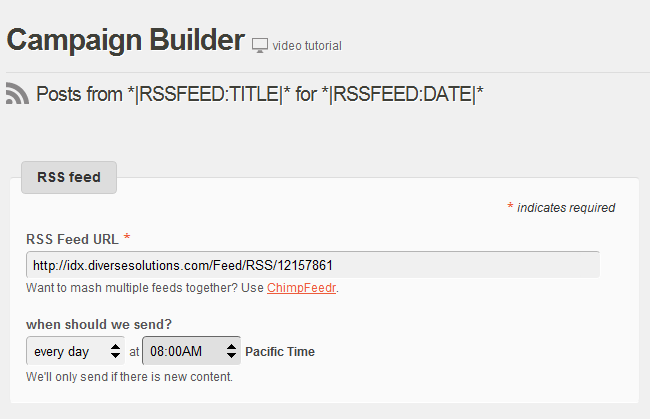 If you click on the RSS icon, that’s the link you want to insert into your campaign-builder in MailChimp to broadcast your RSS-to-Email updates. Once you’ve done that, all you have to do is select a lay-out template and proceed through the rest of the set-up instructions. But mailchimp takes you through that process step-by-step. All you have to do is take a web form, and place it in the location on your sidebar using a “Text” widget. I selected “Communities” as my area type. I added the relevant communities that pertain to the city of Irvine. Then, I added the “IDX – Listings” widget right below that. I selected “City” as my area type, and “Irvine” as my area name and I chose to display the latest listings in the city of Irvine based on the newest ones to have hit the market. Instead of the latest listings, create a quick search link menu where you can access the latest listings in Irvine by Price range (much like I did in the body of that post, only in this case, it sits on your sidebar). 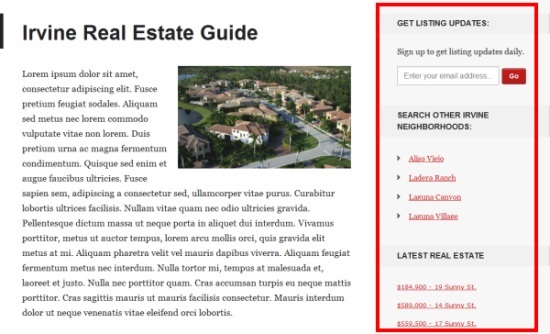 Create a simple navigation widget where you link to searches by property type. To search for “Irvine Condominiums” or “Irvine Foreclosures” for example. Add a Call To Action to try the advanced map search and create an account on your IDX search page. Want to add a little social proof to get people to sign-up to the email list? Try putting a client testimonial right below the sign-up form like this for example. At this point you can really add whatever content you’d like and put your marketing on auto-pilot. You’ve setup an email list to broadcast the latest listings in your community, delivered daily. And you’ve matched the sidebar content to the content on the page to encourage site visitors to spend more time digging through the content on your site. It’s up to you to test, and tweak that sidebar content as needed. Step 3: Publishing your page. Once you’ve created the content for your page and customized your sidebar content, there’s one final step you need to complete for your custom sidebar to appear on that page. In your post editor, on the right-hand side, you’ll see a section that reads: Sidebar Selection. 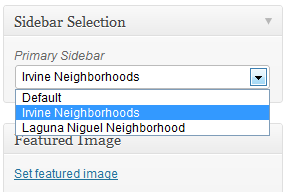 Click on the drop-down and select the appropriate sidebar that you want to render on that page. Once you’ve done that, you’re all set to publish your page with you’re newly created custom sidebar! What else would you do to optimize your community landing pages? Have you tried something like this already? Perfectly formatted strategy, Richardo!!! Just creating these community pages alone is an amazing way to build a blog’s relevant content quickly and get extremely valid, highly targeted traffic too, but adding these customized sidebars and emails is genius! Thanks Suzanne! A little labor intensive to set up maybe, but well worth the added effort. That is exactly what we have been doing for a year now. works great! the only thing that I would change is where the RSS feed links to. I would rather have it link to the IDXpress pages and not the DS search map. Maybe you could set that up as an option? Just a thought. Well, WordPress does handle RSS well, but here’s the thing… I can’t burn a feed for a page. I can burn a feed for a category, and maybe use that category post as a page. Still, even then, though the content via the shortcode is dynamic, I’d have to publish another push to get it to push out via RSS. Quick Mailchimp tip. If you are going to build these for several areas I suggest building one “list” and adding groups to each area. For example, we do the Just Listed ATX list, then we break it down by neighborhood groups. This keeps the list management simple and allows you add someone to multiple lists quickly if you need to. It also allows for some cool reporting. Ed: GREAT tip, thanks!! Totally easy to let list management get out of control otherwise. This post is just killer man. Good job! Pretty cool. I have a different approach but similar. I’ve got about 70 community landing pages. Now that’s a lot of community pages, great job! Thanks Ricardo. A large % of them are ranking on Page 1 of Google so i get a lot of leads that way. Meanwhile, I keep working on the biggies: Atlanta Real Estate, Atlanta Homes, etc. More great content. Thanks for this. It will take a while but well worth the effort! Definitely takes a bit of time, but like you said, well worth the effort!